Kharboucha (Kharboucha ou Ma Ydoum Hal–Kharboucha ou rien n’est eternal—Kharboucha or nothing is eternal), Hamid Zoughi’s directorial debut in 2007 with a release date in late 2008 at a festival in Tangier in Morocco, comprises one of very few exceptionally well-produced Moroccan historical dramas. The film may be viewed in 8 parts with French subtitles on YouTube, but also can be downloaded from a number of bit-torrent sites according to a general Google search. A couple of quite truncated pieces of French writing on the subject are found at http://cinemasfi.over-blog.org/article-10573534.html and http://www.paperblog.fr/2890562/kharboucha-du-mythe-au-patrimoine-22/ and http://www.aujourdhui.ma/culture-details64270.html while so far no writing in English seems available. This analysis/review is actually quite short as Zoughi’s film is rather easily synopsized though it has many tangents (plot elements) that make the story interesting, so you’ll actually have to watch the film to get the full flavor of Kharboucha. The character of Hadda/Kharboucha is played by Houda Sedki, while Khadija Merkoum actually sings Kharboucha’s songs which are then synced by the actress, although Sedki has a trained singing voice—ayta music is quite different from the western classical tradition Sedki trained in. The film was funded by the Centre Cinematographique Marocain and the television channel 2M in Morocco at 3.8 million dirhams, but there is no information about popularity or audience figures. 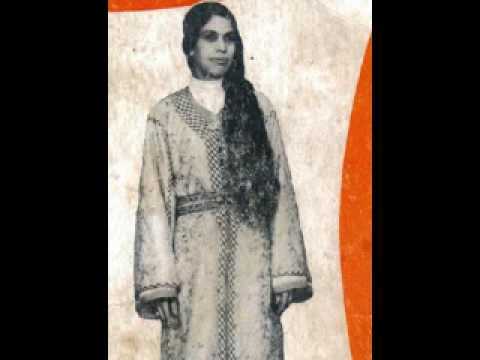 Kharboucha is actually the name of a historical figure from the early-mid 20th century, a singer in the aita (ayta) tradition from the region of Safi (southeast Morocco), whose fame rests as much on her renowned voice as on the politically rebellious content of her songs. Her real name Hadda, Kharboucha originated from the tribe of Oulad Zaid who were attacked and her family slaughtered by a rather evil and quite powerful Caid of the nearby tribe/locality—thus her songs against this Caid and his dictatorial rule and a call for uprising. As a singer, Kharboucha is called a Chikha (cheikha) in Moroccan dialect, which has a number of subtextual meanings—one is that she might be a “loose” woman morally, and another is that she is a singer with a small ensemble of accompanying musicians on traditional instruments. Usually chikhat sing/perform during this time period (and currently) either in individual houses where they are invited to entertain for parties, or at souks (traveling or occasional outdoor markets), at weddings and other important social events like moussems (religious pilgrimages), and equally for male and female audiences separately. The fact of cheikhats’ social mobility and personal agency when other women are specifically not socially mobile nor have personal agency lends to their reputation as being less moral or less bound by social mores and prohibitions than other women, whether in the past as in the film Kharboucha, or in the present time in which cheikhat’s continue to perform throughout Morocco. The change in the present time is that one can find cheikhat’s also singing and dancing in bars/lounges in addition to the venues noted above, while some have become incredibly famous with albums, etc. Kharboucha’s story, and thus the story of the film, is that first she is punished for being in love and consorting with the Caid’s/tribal hash seller, then when her village is pillaged and her family slain in a raid by the Caid who wants to replace all his livestock killed by an epidemic with the livestock of the neighboring tribe—she sings out publicly against the Caid’s cruelty and injustice and merits some more beating and imprisonment. However, the Caid’s son is in love with her, and says he will destroy his father if she will trust in him—however, this son’s plot is overthrown by the wily Caid and Kharboucha imprisoned again; Kharboucha escapes from prison and is sheltered by various other tribal leaders until one treacherously turns her in to gain favor with the Caid and she ends up back in prison hung by her feet for days on end. The Caid won’t kill her and turn her into a martyr and strengthen her songs’ power, but decides instead to marry her. On the wedding night, Kharboucha tries to poison him, and when that doesn’t work she breaks into seditious song yet again. While the Caid ushers her off to be walled-in alive, we hear the other tribal leaders in attendance at the wedding repeat Kharboucha’s song, much to the Caid’s chagrin, while Kharboucha’s tribe has secretly prepared to attack the Caid to regain their honor, to save Kharboucha, and to get back their livestock and goods. However, at the time Kharboucha is being walled-in alive, her lover who leads the attack is shot and killed as well. Thus, the film ends without us knowing the outcome of the raid against the Caid, unless we know our Moroccan tribal history! What we do know is that Kharboucha and her lover are both martyred, and that her songs have lived on until today in the Aita (ayta) tradition. One of the most wonderful components of the film, aside from the excellent singing given voice numerous times throughout the story, is the quality of the historical rendering of costumes, customs, décor and settings. Set between El Jadida and Safi, both in the countryside and in the Kasbah of Settat, almost all of the costumes, setting and décor seem very authentic and only the long beards of the Jewish merchants were noticeably fake. Apparently many of the crew worked for very low or no wages on the film since so much of its budget had to be spent on authentic décor and costumes. From inclusion of black slaves, Jewish merchants, musical troupes, and various “tradesmen” in the film, all the personages one would expect to find were present, including hunting dogs (sloughi’s) and falcons, wonderfully outfitted horses, a lavish Caid and family, and poor villagers/tribes-persons. Because the film focused on Kharboucha, very little attention was paid in the script to elaborating on other personae such as the Jewish merchants or the slaves, except that they were present, which smacks of authenticity of the story world. There are several important cultural components to write about this film. French colonialism was spreading into the countryside and in an effort to quell the tribal disturbances, the French enlisted sympathizers like the Caid and made them quite powerful in their regions, power which could be abused. At the time, there was central power in the makhzen, or the sultan’s family, with much tribal unrest in much of the countryside that did not want/could not pay taxes to the sultan and thus were considered in rebellion (siba) against the throne. The Caid’s role was to quell the siba areas, collect the taxes, and otherwise he could pretty much rule however he wanted as long as the sultan and French colonizer interests were being maintained. At the time, again, there was collusion between the colonizers and the throne/the sultan. But this is another longer story of shifting alliances that can’t be developed sufficiently here except to say that the film presages a rebellion against the Caid synonymous with rebellion against the French that culminates in the late 40s. What is important is that the throne and the French presence are only indirectly felt in the film—through the Caid’s power to collect taxes from his subjects, his power to attack neighbors with only a thin reprimand from the throne, and the Caid’s power to use his own army as he saw fit. Thus the Caid attacks the Oulad Zaid to steal their sheep and other livestock to replace that lost in his tribe due to a strange epidemic—which he blames on the farmers using Spanish wheat rather than Moroccan—which would be another long story about the time of famine in Morocco where a lot of tribes and villages were forced to utilize foreign wheat. The early 40s were years of famine throughout Morocco where rationing of essential goods occurred, along with the distribution of goods by the French that would have been overseen by the Caid, probably in favor of his own tribe’s welfare. The film alludes to many things historically significant but does not delve into them at all, but expects its audience to have the background to make further sense of the references. This would be a weakness of the film for non-Moroccans perhaps—the lack of real contextuality in which to place the events which seem to exist between Kharboucha and the Caid but are really relative to the situation throughout the country as a whole. In the time of the story, women had no rights whatsoever, and in fact in face of the Caid’s proclamations almost no one in the story was safe from being tossed in prison for any slight infringement, or even being killed. We hear from the Caid’s wife that she was married to him as a young girl, a very usual practice of the place and time, and she even gives Kharboucha the poison to kill the Caid whenever the time is right—Kharboucha puts it in the milk traditionally shared by the bride and groom to cement the marriage in public, but it apparently doesn’t work. However, compared to other Moroccan films, this film does not particularly address women’s issues per se, as it focuses principally on one character and her struggle which does not necessarily extend to all women. But some components of the treatment of women are included, such as the Caid’s wife’s young marriage. Further, particularly when the issue is village life, women’s advances were far behind those that might be apparent in urban life at the same time. If the film, according to the director, is set in the 1940s, at the height of French colonialism, urban women might have more freedom of movement in the urban setting, although ostensibly still they would be controlled by the decisions of the husband/father regarding their mobility and agency. I believe that it is during this period that the sultan of Morocco allowed his daughters to appear in western clothing, without veil, and to attend schooling, and many other advances for women that would not have been felt in village or tribal life whatsoever. Kharboucha as a cheikha, however, has quite a bit more freedom of movement and agency; she even chooses her own lover, which is not ordinary in the village or tribal setting where usually the father chooses the husband and the daughter simply obeys. But the film doesn’t represent her doing anything more than holding hands and listening to music with this lover—which is apparently enough to get her beaten and jailed for a time. Much like the power of the voice in Les Silences du Palais by Moufida Tlatli, in this film Kharboucha’s voice is her power and she calls in song for resistance to the Caid, and thus in essence for resistance to oppression in whatever form. This could signify oppression against women, French oppression within Morocco, the makhzen’s oppression of the rural areas through taxation, and a host of other oppressions only alluded to marginally. One other aspect raised tangentially in the film is the relation between “white” Moroccans and Moroccans “of color”. In one scene a man declares his devotion to his wife who is dark skinned, and the Caid’s son makes a snide remark about her color. While others are “white”, she is “brown” and marked as other, as supposedly inferior at the time and place, given the history of sub-Saharan slavery and different treatment of people of color in Morocco. While many former slaves and individuals of color became powerful in government due to their relationship to seats of power, such as Caids and the sultans and royal families, for a long time there was a perceived difference such that a “white” would not necessarily marry a “brown” or “black” individual unless that individual had achieved some status and power. The situation has changed in modern times, with much intermixing/intermarriage of former slaves, people of color, and “white” Moroccans, but in the era/context of the story it would have been unusual for this man to have taken a wife of color, though not unusual for families to have slaves of color, as the Caid has a very black man-servant. Morocco did not abolish slavery until the mid-20th century, although many slaves were not of color necessarily, though quite a few did come from sub-Saharan Africa. This issue is not often raised in films, being still a taboo subject in Morocco where issues of racism are very difficultly addressed publicly. The same goes for the presence of Jewish merchants in the film, which exist but nothing much is really developed about them or their real interrelationships within the tribal culture. Overall, Hamid Zoughi has constructed a feature film with many subtexts but one main thrust which is the Caid’s abuse of his power over others, especially Kharboucha, and her resistance through song and strength of will. I believe the film could have been stronger if some of the subtexts had been brought to the fore, but the film is what it is, and for persons interested in seeing a historical Morocco, the film decors and costumes are almost impeccable, though again you might laugh at a couple of the fake beards! The music is awesome, with some of Kharboucha’s original songs, and some developed specifically for the film, but within the ayta traditional style. This entry was posted in Moroccan films and tagged arabic, cinema, cinema and culture, film, hamid zoughi, historical film, international cinema, international film, international movies, Kharboucha, middle east, Moroccan, Moroccan cinema, Moroccan film, moroccan history, Moroccan movies, Morocco, movies, north africa, north african cinema. Bookmark the permalink. Sorry, apparently I don’t have any good advice because I haven’t been able to blog in a while! I just get inspired and start writing. But let me say, just waiting for that inspiration is good time spent!